Just my luck! We entered Los Angeles right at 4:55pm. Rush hour traffic had just begun. 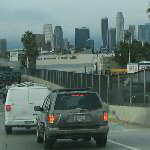 To see our pictures from LA Rush Hour Traffic, click the link below. As we drove from Los Angeles to Santa Barbara, we came upon a scenic portion of the Pacific Coast Highway, also known as the PCH 101. To view the pictures from our pit stop on the PCH 101 click below. We started our? trip to California in San Diego, then drove up to Los Angeles and finished up our week in Santa Barbara. Along the way we stopped for a pit stop in Ventura California to take a few pictures of where my girlfriend’s grandfather spent a good part of his life. To see our pictures from Ventura California Click Below. During our stay in Santa Barbara we stayed a small and peaceful place called the Marina Beach Motel on Bath Street. The hotel is located only 33 steps from the beach! 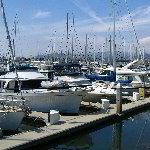 To see our pictures of the Marina Beach Motel in Santa Barbara California click on the link below. One bright sunny day during our working vacation trip to Santa Barbara California, we stopped at the Santa Barbara Zoo to check out the animals and take some pictures. To view my pictures from the Santa Barbara Zoo click on the link below. During our vacation in Santa Barbara we spent a day just exploring the city. To see pictures of all the sights of Santa Barbara California click on the link below. We went on a whale watching tour in Santa Barbara aboard the Sunset Kidd 2 sailing yacht. The quiet nature of a sail boat allowed us to get close to the dolphins and a pod of Giant California Grey whales. To view the pictures from our whale watching sailboat tour in Santa Barbara click on the link below. During our trip to California we rented a kayak in the Santa Barbara harbor by Stearns Wharf. We then paddled out to the Pacific Ocean and kayaked up along the Santa Barbara coastline. 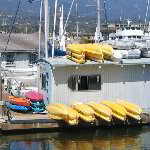 To check out our kayaking pictures from Santa Barbara California click on the link below. I know I’m a few years late, but I just added my pictures from the 2003 National Stunt Riding Association Championships. All the? best? professional sport bike motorcyle stunt riders showed up for the competition and the fans at the Gainesville Florida? Raceway? got quite a show. I snapped lots of pictures throughout the competition of the riders? wheelies, stoppies, burnouts and other daring stunts. To check out all my sportbike stunting pictures click on the link below. I just added pictures from my first tandem skydive jump in Deland, FL. The experience was a birthday present from my girlfriend. She opted for the full photo and video package so we got a roll of pictures and a DVD. Click below to view the pictures.